Go and see it, if you’ve ever been a lonely kid. Go and see it if you’ve ever been misunderstood or angry for no reason. You see being a kid is hard. We try to forget that when we grow up. We try to just remember the fun times and the good weather. But no one listens to you. They’re too busy to play with you. You don’t know what’s going on most of the time and have no control over anything. It’s frustrating and sometimes you lash out for no reason. Where The Wild Things Are understands this and says, “You know what, it’s ok to feel like that”. Everyone feels sad sometimes and just wants someone to make them feel better. This isn’t a kids film, it’s a film about being a kid and that’s a subtle but profound difference. It’s made from a kids perspective. So some things don’t make sense, things happen randomly and situations get out of control. And in the the end, even though we may want it too not everything is resolved neatly. And just like life, not everyone will enjoy this film. Many people in the audience didn’t like it, or understand it. And that’s ok too. This review’s all jumbled up and messy, just like the film. But I’m just trying to get down how I feel about it and that’s the best thing about this film, how much it makes you feel. It dredged up a lot of feelings, not all of them pleasant. I haven’t talked much about the film itself. It looks amazing (check out the photo above). 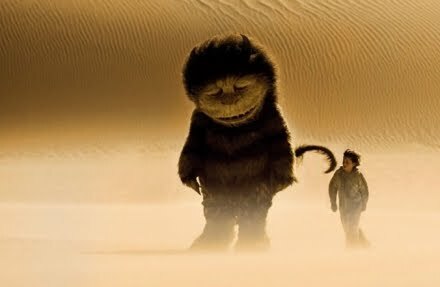 The Wild Things themselves are a joy to behold and are an incredible mix of puppetry and CGI. The acting, both voice and from Max Records (the kid) are awesome and understated. I don’t want to talk much more about it, just go and see it and take your kids. There are some dark and scary bits in it but they can handle it. We saw the film as a promotion for an organisation called Square Eyes. There mission is to foster a love of film in children. And to show them good films, not just CGI talking animals (although there is a place for them too). If this is the kind of film they want to show kids then we should all support them. We’re lucky that this film exists at all and wasn’t made by Dreamworks featuring CGI rapping streetwise Wild Things. We need to reward this kind of film making, so go and see it. This entry was posted in film review, films, Where the Wild Things Are. Bookmark the permalink.